What exactly are listed wastes? Identify hazardous wastes by understanding listed wastes and their classifications with US Chemical Storage. The Environmental Protection Agency (EPA) has classified specific hazardous wastes because of their potential dangers to human health or the environment. These wastes are given the term “listed wastes” and are organized into four classes found below. F-list wastes: The F-list includes specific solid wastes from particular industrial or manufacturing processes. F-listed wastes are generated from different sectors in the industry, therefore these wastes are commonly known as non-specific source wastes. Wastes included in this listing involves solvents or similar substances that were used in cleaning or degreasing operations. F-list wastes can be found under 40 CFR (§261.31) regulations. P-list & U-list wastes: These wastes are considered unused commercial chemical products that have been discarded. P-list and U-list categories include a wide variety of chemicals including pharmaceutical products and pesticides. Chemical wastes included on the P- and U-lists are found under 40 CFR (§261.33). Hazardous waste lockers by US Chemical Storage offer a safe and protected environment, inside and out, for storing hazardous materials and hazardous waste materials. When compliantly storing hazardous wastes, a hazardous waste locker is the perfect solution for keeping your personnel, investments and the environment safe from the risks associated with waste materials. US Chemical Storage offers fire-rated or non-fire rated constructions to compliantly store hazardous wastes nearby or inside your facility, in order to increase operational efficiencies. 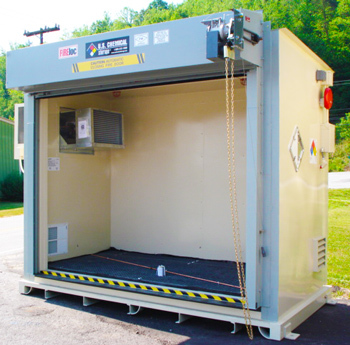 The hazardous waste locker by US Chemical Storage provides superior protection and safety. Manufactured from heavy-gauge steel and designed by professional engineers to keep you safe. Customize your hazardous waste locker with a wide range of accessories including, but not limited to explosion relief panels, mechanical ventilation, explosion proof lighting, alarm systems, racks, shelving, liquid level sensors, gas detectors and more. Completely customize your hazardous waste locker with explosion proof and non-explosion proof accessories for ultimate protection. The fully compliant hazardous waste locker by US Chemical Storage features a 15-year structural warranty, and a leak-proof secondary sump containment for maximum safety. All hazardous waste lockers are 100% compliant and uniquely designed to meet your exact requirements. Meets EPA, OSHA, NFPA regulations and FM or Warnock Hersey approvals. The hazardous waste storage locker by US Chemical Storage is strong, dependable, and 100% compliant to keep you safe and protected.